Item # 315091 Stash Points: 395 (?) This is the number of points you get in The Zumiez Stash for purchasing this item. Stash points are redeemable for exclusive rewards only available to Zumiez Stash members. To redeem your points check out the rewards catalog on thestash.zumiez.com. Mark your stuff dangerous with the Black Cat sticker from Loser Machine. 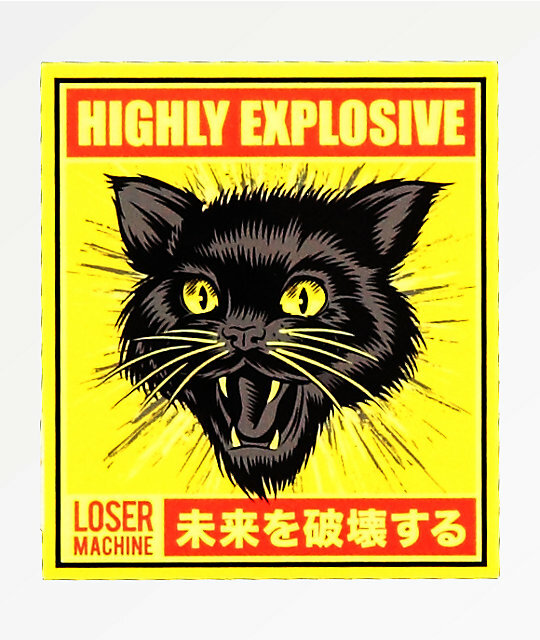 This yellow sticker features a black cat's head at the center with "Highly Explosive" text at the top. Black Cat Sticker from Loser Machine. Black cat head on yellow background with red text graphic. 2.5" x 2.25" | 6cm x 5.75cm (approx. ).